Travel back in time with the Instant Effects Deep Line Elixir; an age-defying, anti-pollution treatment that plumps skin for a younger-looking complexion. 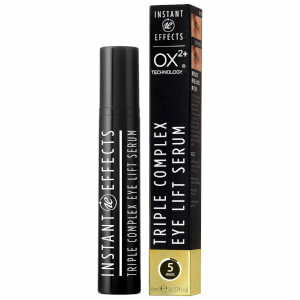 Combining the skin’s natural metabolism with the brand’s patented anti-ageing technology (OX2) that works by pumping oxygen into skin to naturally increase bloody flow, particularly into areas such as the under-eye or around wrinkles, the formulation instantly helps to fil in and minimise the appearance and depth of wrinkles and expression lines. Packed with antioxidant benefits that help protect against external aggressors whilst promoting skin’s elasticity and moisture, the elixir leaves skin glowing with youthful radiance. Gently shake to activate the Deep Line Elixir (note: the clear solution will appear cloudy once activated). Twist the bottom anti-clockwise to dispense product. Paint over desired line or wrinkle. Use index finger to firmly rub along the line 3 times and against the line 4 times. For the best results, apply morning and evening to freshly cleansed skin.